A beekeeper suit is comprised of protective garments which are usually worn by people involved in the business/hobby of beekeeping. Bees, cute and fuzzy as they are, are easily provoked and when provoked can unleash very painful stings (which can be deadly if you’re allergic) on their victims, especially in their large, hive numbers. It is for this matter that people who keep them must ensure that they properly protect themselves against the insects by wearing the beekeeper suit. The main reason to keep bees is of course to get their honey to sell for a profit, or for personal use at home. But this is not the only benefit that you can get from bees; bees wax is another product produced by bees which can be sold, as it has practical applications in human food and flavoring. You can also keep bees to sell them to others who may be prospective beekeepers or those who seek them for scientific study purposes. Crop farmers may also need bees to help them in pollinating their crops, i.e. where cross pollination is required. So with all these benefits you can get from beekeeping, it must be stressed that you must take proper precaution when dealing with them. Check out our reviews to find the beekeeper suit that suits you best. Read on below for more information on the accessories that go hand in hand with the beekeeper suit. Cover your face for all the right reasons. As a prospective beekeeper, you should know that your head is one of the most important areas to protect, and the beekeeper hat does just that. However, the hat alone is not enough, and it’s for that reason that the hat should always be worn with a beekeeping veil. Usually, the hat is covered by the veil on the outside so that they become one piece. Even though the hat and the veil can come separated, it sounds rather impractical and a little insecure compared to when they come as one piece which is the veil and hat design. But that’s more of a preference thing. However, one advantage of opting for the hat and the veil as one piece is that they are easy to fasten to the beekeeper suit making it impossible for any bee to enter. It can be said that the beekeeper hat is used to protect the head and the beekeeping veil is used to protect the neck and the face. The neck and the face are very crucial and delicate parts of the body that need to be well protected from any possible bee attack. There have been a number of cases where some beekeepers have been attacked in these areas resulting in unfortunate severe pain and swelling. Bee stings on bare hands are usually mild (provided you’re not allergic) and can easily be removed. The case is totally different when bees sting on the face or neck because then you will certainly need a mirror to be able to remove the sting from the neck for instance. The swelling and pain experienced as a result of a sting on the face or neck is also unimaginable (especially if you are allergic). This is why the beekeeper hat and the beekeeping veil are important accessories. It must be noted that a veil without a hat makes very little sense in offering protection and so is the hat without a veil. The two go hand in hand. For great deals on beekeeper veils, be sure to check out Amazon.com. The round veil is the classic design and it provides a wide field of view. They also have plenty of space between the face and the protective mesh. With its highly breathable mesh, the wearer gets great ventilation and they help keep cool during the hot summer days. It is great for both the beginner and the pro beekeeper alike. The fencing veil comes in a modern design that is designed in such a way that it minimizes contact between the veil and the head and hair. With such a design, beekeepers no longer have to worry about how their hair looks or their safety from the painful bee stings. Square veil jackets have a folding design that allows the beekeeper to store it easily in their beekeeping tool bag. They have a front mesh that is quite spacious for sufficient view and their side mesh allows fresh and cool hair to seep in. Be sure to protect your hands too. 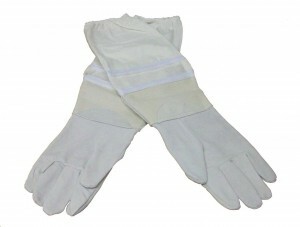 Beekeeping gloves are an accessory usually worn with the beekeeper suit as they act as protection for the beekeeper’s hands. Bees are usually easily provoked when honey is in their hives, so beekeepers should be extra cautious to always wear the gloves along with the suit for maximum protection. Still, there are some beekeepers that opt not to use gloves for fear of squashing the bees by accident. The problem with this is that you can easily be stung and suffer painful swelling. Nobody wants that, so before you start inspecting hives, wrap up and protect yourself. For great deals on beekeeping gloves, be sure to check out Amazon.com. The beekeeping jacket is another important part of a beekeeper’s protection against bee stings. The jacket usually resembles a parka jacket or those of firefighters, but designs do vary. The best beekeeping jacket is one that the hat and the veil can be fastened to using a zipper. When you have moved away from the bee hive you can easily unzip the hat and veil so that they can drop behind your head but still remain attached to the jacket. Beekeeping jackets should be white because bees usually tend to avoid white clothing. The other reason for choosing a white beekeeping jacket is that most beekeeping activities are usually done during the summer. With all the heat during summer a white jacket will absorb less heat from the sun thus making it you a little cooler. A standard jacket for beekeeping has 6 or more pockets – 2 pockets for the hive tool on its sleeves, 2 Velcro pockets on the chest, and 2 pockets with double stitches near the waist. There are also elastic thumb-holds that help secure the jacket in place. You should go for a beekeeping jacket that is larger than your actual body size, since the jackets are usually worn over your clothes. For great deals on beekeeping jackets, be sure to check out Amazon.com. Beekeeping jackets are designed using various materials. Some of the well-known types include aerated, polycotton, and ventilated materials. 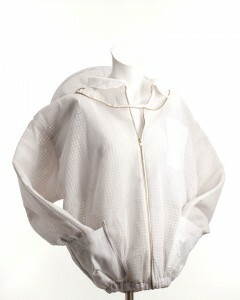 The aerated bee jackets are made using polycotton fabric. However, foam panels and mesh have been added on the chest and the back so as to provide an additional air flow. The polycotton bee jackets are made with 50/50 polyester and cotton. They have been interwoven using a special interlocking pattern that make it near impossible for bee stings to penetrate. On the other hand, ventilated bee jackets come with a 3D layer design and have 100% synthetic fabric on their outer side. They also feature a foam core that provides an air gap between the two fabric layers. This air gap is longer than the length of the bee stinger thus it protects the wearer sufficiently. The beekeeper boots are the final accessory that comprise the beekeeper suit. When harvesting honey, some bees will drop to the ground and may crawl up inside your clothes and sting you, and this why the beekeeper boots come in handy. The boots ensure that the bees can’t crawl up into your trousers and unleash their stings. The boots should always be worn with the rest of the accessories that make up the suit. 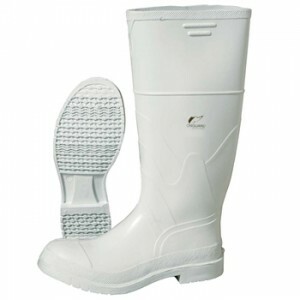 When shopping for beekeeper boots, it is advisable to choose those that are made of quality rubber because these are strong and will last for a much longer time. Watch the video below to get a great idea of how you can go about putting on the beekeeper suit. If you’re planning on getting started in beekeeping, you should always make sure that you’re wearing the proper protective gear to keep you safe form any potential bee attack. Bees can be dangerous insects in their hive numbers and so a beekeeper must always take precautionary measures to ensure their safety at all times. The best available protection from bees is the beekeeper suit that is complete with all its accessories such as beekeeping gloves, beekeeper hat and beekeeping veil, beekeeping jacket and beekeeper boots. Beekeeper suits come in various sizes, designs and prices. Read our reviews to find the suit that’s right for you. 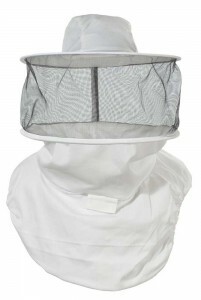 View our rankings of the best ventilated beekeeping suits.